"'It is 1914, and twenty-five-year-old Frances Marion has left her (second) husband and her Northern California home for the lure of Los Angeles, where she is determined to live independently as an artist. But the word on everyone's lips these days is "flickers"--the silent moving pictures enthralling theatergoers. Turn any corner in this burgeoning town and you'll find made-up actors running around, as a movie camera captures it all. But their ambitions are challenged by both the men around them and the limitations imposed on their gender--and their astronomical success could come at a price. As Mary, the world's highest paid and most beloved actress, struggles to live her life under the spotlight, she also wonders if it is possible to find love, even with the dashing actor Douglas Fairbanks. Frances, too, longs to share her life with someone. As in any good Hollywood story, dramas will play out, personalities will clash, and even the deepest friendships might be shattered." I've been eager to dive back into some historical fiction lately, and Melanie Benjamin fit that mark perfectly. 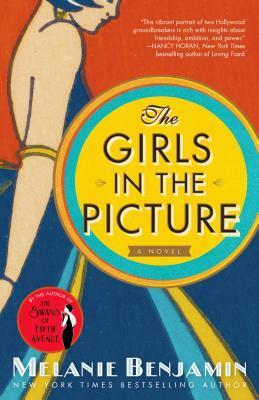 The Girls in the Picture is an ambitious undertaking, tackling two incredible women who paved the way for so many other women to come, and Benjamin did truly epic work in chronicling this fictionalized account. Prior to reading The Girls in the Picture, I'd say that my knowledge of the beginnings of the movie industry--from the "flickers" to longer silent movies to "talkies"--was relatively lacking. I knew the basics of how things developed, but nothing more than that. With this book, I feel like I now have a fairly solid foundation of how the movie industry developed and who some of the biggest players were and I'm thrilled that I got to go on this journey with the incredible screenwriter Frances Marion and actress Mary Pickford. The Girls in the Picture switches between the narratives of Fran and Mary, the former being told in first person POV and the latter told in third person. Because Fran was told in first person, I felt a lot closer to her as a character and was more engaged in her life, which I assume was the intent of the author. Mary was a slightly more unpredictable and enigmatic figure because I couldn't get inside her head to the same extent as Fran, and I actually liked this balance between the two POVs. It also helped to keep them very distinct from one another, though their characters and personalities are already very different from one another and provided a striking contrast between one another. I loved following Fran. I had heard of Mary Pickford before, but Frances Marion was a new name for me and now I can't believe I'd never heard of her. Her accomplishments and attitude toward her career are truly inspirational, and although I don't have much prior knowledge about her to fully compare, it seems that Benjamin did a wonderful job portraying her. I've since found myself researching and looking into Fran's life ever since I put down this book, which is the sign of good writing to me when the author makes me want to learn more about something. Fran is a determined go-getter, someone who is not afraid to put herself out there and take advantage of every single opportunity given to her. She's also an empathetic person who seems to genuinely care about those around her. I was impressed by what a strong, unique, and believable voice Benjamin was able to imbue in Fran, bringing her to life and letting me feel strong connections with her. Mary's portrayal is just as vivid as Fran's, though the connection with her character is not as strong due to the manner in which her story is told. Still, her development from a young, eager, talented actress to the woman she grows up to be was handled wonderfully. Both women have important stories and lessons to tel, and I appreciated being able to go along for the ride. I loved how Benjamin incorporated so many quiet--yet meaningfully loud--notes on the sexism that these women faced in the movie business. I think that even though we are living in a time where women are making their voices heard more in regards to harassment and sexism, it's still easy to ignore the issues that occurred in the past. Benjamin made these struggles real and shone a great light on them. I was especially excited to read about Fran's involvement in World War I and her documentation of the women's roles during that time--I had no idea that existed and I'm so glad Benjamin gave it the time and notice it served in this book. Although I truly enjoyed this book and the lives of these two women, there were a few minor issues that I had with it that I'd like to note. First, I found the writing style seemed slightly rushed at times. Benjamin has a lot of content to work with so I can understand it's probably hard to fit it all in, but I sometimes felt things seemed to move too quickly and had somewhat bumpy writing or dialogue along the way. The Girls in the Pictures has a lot of rather large time jumps when the POVs switch as well (continuously moving in the future, however, no back-and-forth time jumps), so sometimes I felt as though I missed out on too much or things changed too quickly. This isn't something that took away much from my enjoyment overall, as I still found the story itself engaging and I wanted to know what would happen, but it is also what made me hold back from fully loving this as much as I could have. Similarly, as much as I love that Benjamin obviously performed a lot of research, there were a few moments throughout where I almost felt as though I were reading a nonfiction book that was talking about certain developments in the movie business when discussing companies and public figures. Again, this isn't a huge issue and I did like learning about the history, but it does slow down the pace a bit. That being said, I absolutely plan to continue checking out more of Melanie Benjamin's books (including her upcoming release Mistress of the Ritz), and I encourage any historical fiction fans to check her out as well. Overall, I've given The Girls in the Picture four stars! I have a couple of her books on my TBR, looking forward to this one!